The Ontario Liberals face a vexing problem heading into the June election. Polls show that voters actually like recent Liberal policies. But as for party leader Kathleen Wynne? Not so much. Her approval ratings are the pits. Even the fractious and chaotic Ontario PC leadership campaign has done little to move the needle in her favour. Last fall, a survey conducted by Angus Reid Institute pegged Wynne’s approval rating at just 17 per cent. That was actually an improvement from earlier in the year, when her ratings hit rock bottom at 12 per cent. Other firms have found a similar lack of enthusiasm for the premier. In December, an Ipsos poll reported 80 per cent of those surveyed felt it was time for a change in government, and just 26 per cent strongly or somewhat approved of the Liberals’ job performance under Wynne. Even surveys of self-identified Liberals don’t offer much hope. Forum Research found 34 per cent of respondents who intend to vote for the party disapprove of Wynne’s performance, which is unusually low for a leader in office. Oddly, recent Liberal initiatives are proving popular. In January, Campaign Research found 72 per cent of survey respondents approved of the Liberal’s pharmacare plan to provide free medication to those aged 24 and under, which was introduced in last year’s budget. Even the Liberals’ controversial decision to swiftly hike the minimum wage to $ 15 an hour by 2019 gained widespread approval, with 60 per cent in favour. So what is it about Wynne? Fourteen years of Liberal rule in Ontario has a lot to do with it. “Think of it this way,” says Lorne Bozinoff, president of Forum Research. “They’ve pretty much annoyed everybody.” Indeed, more than a decade in power is ample time to run afoul of most constituencies in one way or another—doctors aggrieved by fee rollbacks, small business owners adjusting to wage increases, rural towns grappling with school closures, renters priced out of the housing market or simply anyone who’s ever paid a hydro bill. “They’ve just been around too long and people are getting tired of them,” Bozinoff says. The disappointment is compounded with Wynne, given where she came from. When she became leader, Wynne marketed herself as a fresh face for the Liberals who would distance the party from the Dalton McGuinty era, which was characterized by mismanagement (eHealth, Ornge, gas plants), cronyism and profligate spending. That Wynne led the party to victory in 2014 after all that is a testament to her abilities (not to mention the odiousness of her chief opponent’s promise to axe 100,00 public sector jobs). But the momentum waned, and critics charge Wynne represents continuity more than anything else. “People asked for change, and they did not see change,” says Geneviève Tellier, a political science professor at the University of Ottawa. RELATED: Is Doug Ford’s victory a ‘lifeline to Wynne’s Liberals’? Another factor is that Wynne is not seen as a particularly charismatic leader. “She’s not a Justin Trudeau, who connects very well with people,” Tellier says. The same can be said for loads of politicians, of course, but charm can go a long way to saving embattled ones. The premier embarked on a series of town hall meetings in recent months to prove her accessibility and accountability to voters, but as a charm offensive, the effort fell flat. 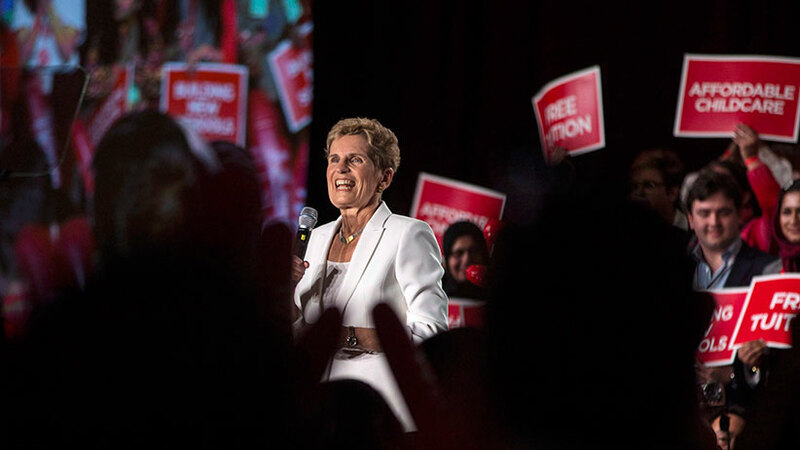 Headlines highlighted the animosity Wynne faced from the crowds. In Ancaster, she got a “rough ride” from autoworkers. In Windsor, she was “pressed” on the lack of local social services. In Ottawa, she got an “earful” over everything from child care to the minimum wage. It must also be asked whether Wynne is judged more harshly because she is a woman, as is too often the case in politics. Tellier, for one, is skeptical of the notion. “I wouldn’t be prepared to say this is a factor,” she says. Andrea Howarth of the NDP, for example, polls quite favourably in the province, Tellier notes. Whatever the reasons for Wynne’s poll numbers, the election of Doug Ford as PC leader changes the landscape. His predecessor, Patrick Brown, positioned the party squarely in the centre, and his platform was closer to longstanding Liberal policies than many would have assumed. He was gearing up for an election focused on personality. Brown seemed to indicate that the province didn’t need a wholesale change in direction, but a change in leader. The Ford brand of populist politics, however, is drastically different from what the Liberals represent. Ford picked up support from social conservatives, for example, and recently said it’s time to reconsider whether girls under 16 should require parental permission for abortions. A debate about policies and values is one Wynne will relish at this point, according to Duffy. “Any 15-year-old government,” he says, “welcomes any opportunity to talk about something other than change in personnel.” Getting voters to stop dwelling on their dislike for her, though, may prove to be one of Wynne’s biggest challenges yet.